Hey there, and happy (almost) Friday! Here is the collection I put together for the kid's adventure theme. I love the soft colors and motifs, and I think this would make for an adorable baby or children's room! As promised, here are the Halloween designs I created for this year. I loooove my little halloween collection (in 3 different colorways...I'm a little indecisive) and the mockups. I finished up my floral ditsy patterns for this week's trend, and here are the results! I created a couple of different color palettes: one is kind-of spring-y, and the other has a fall vibe. I've been working on these three briefs over the past week or so, and I'm going to be submitting my final patterns today. I actually enjoy working to a brief, and I tend to create my own "briefs" when I'm creating patterns on my own. I like having guidelines, going with a certain theme, and creating a moodboard to help me start brainstorming ideas for patterns. I ended up using a lot of the motifs I had already created for past nautical designs, and I'm pretty happy with the results. I think this would have been easier if I would have just created a design-not a repeating pattern, but I still think these capture the French Riviera tone. This was definitely my easiest brief to work with. 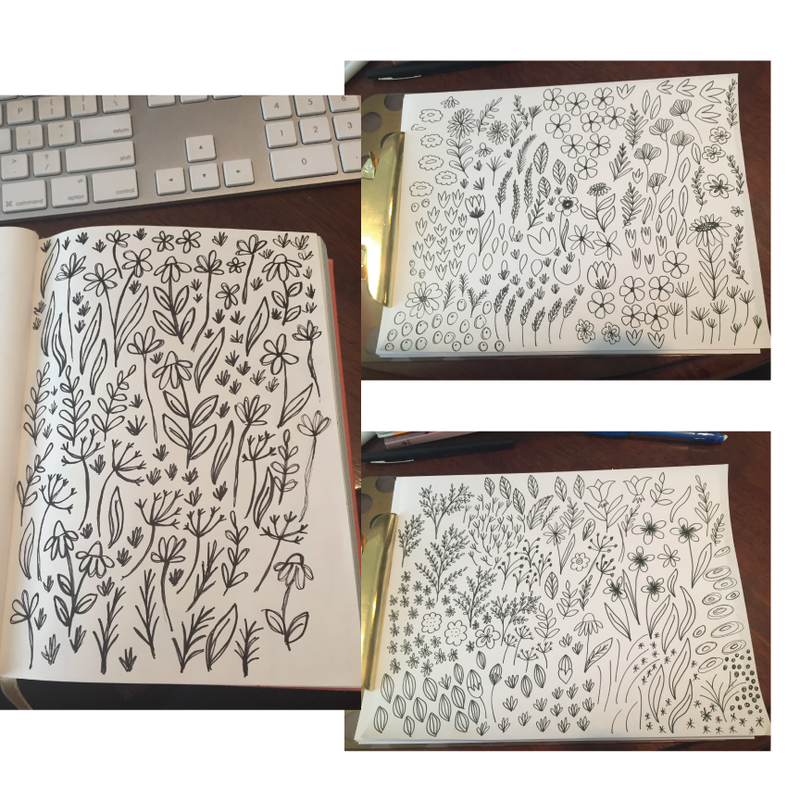 I'm always doodling flowers, and I love how all of these dense, "meadowy" patterns turned out. I tried to work with color palettes that were different than my typical bright and crazy colors, and I think I captured the tone of nature and wildflowers. This was definitely the most difficult brief to work with. I don't have much (if any) experience with pop art design, but once I got my initial idea down, I got really excited about this brief! I actually love my final pattern. I think it's fun, has that "comic book" feel, and sticks to the brief well. The first week of briefs was a lot of fun! I'm excited to see what next week brings. It's going to be hard for me to decide which patterns to submit, but I'm glad that I'm satisfied with all of my patterns that I've created. Thanks for reading!